After we left Indian Boundary Campground we had two choices. 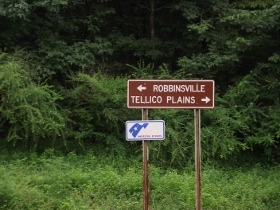 One was to go back home through Tellico Plains, Tennessee. The other was to stay on our appointed route, cross the state line and go into Robbinsville in Graham County, North Carolina. Why go back the way we came? We chose to continue on our Etowah to Etowah in six hours journey and complete the loop. After leaving the campground we ran into some of the 2011 road construction on the Cherohala Skyway. The construction crew member wouldn't let us out of the car but we could pull over to the overlook and walk around. I've detailed the short wait on my article about the road construction. That way you won't get bored with the details and continue reading about our Cherohala Skyway journey. One look at our gas gauge told us how glad we would be to get to Robbinsville. We had enough to get into the town but we anticipated that the drive after that might need a little extra go-juice. It is worth mentioning that there are three restrooms on the Cherohala Skyway. Bring hand sanitizer because there isn't any water. These are at Turkey Creek about 1/3 of the way into the skyway and Stratton Ridge about 1/2 way. The other restroom is at Hooper Bald about 2/3 of the way through the Cherohala Skyway. Stopping here was pretty cool. The picnic tables make it a good spot but there's an even better reason to pause here. At this point you are just over a mile above sea level at 5,290 feet - and that's not the highest elevation on the road trip.